It would be hard to find a voice that captures the mood of a song more perfectly than this one. It's the voice that soars with inspiration, soul and warmth. 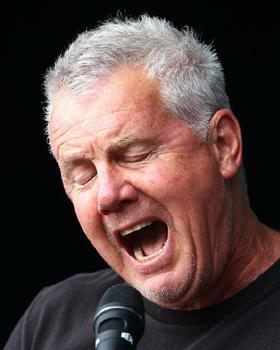 The voice of course belongs to Australian singer Daryl Braithwaite. In a distinguished career spanning more than 30 years, Daryl Braithwaite is one of Australia's award winning premier performers. His initial success as a singer came with Sherbet, a band which forever remains in the history books of Australian music. Throughout the 70's, Sherbet produced 20 national Top 40 singles and was the first Australian band to top the one million dollar mark in album sales in the country, with a total of 15 albums and 30 singles to the credit; with songs like "Summer Love" becoming the highest selling single of 1975. And, "Howzat" not only a #1 hit in Australia, but also achieved #2 in England. Following the success of Sherbet, Daryl returned to the Australian music scene in a very big way as a solo performer in 1988 with the release of the phenomenally successful album "Edge", which spent well over a year in the national charts. Edge spawned four hit singles with "As The Days Go By", "All I Do", "Let Me Be", and the gold single "One Summer". The album itself topped the ARIA charts in 1989 and became the highest selling CD in CBS Australia's history.